When Loam abruptly closed its doors for good over two years ago I was rather annoyed with myself. I should have made the effort earlier to head down to Drysdale and I was kicking myself. To add salt to the wound many of my food contacts would often repeat how great the restaurant was. So when I heard Aaron Turner had decided to make a come back I wasted no time in getting a reservation to his new venture in Geelong. 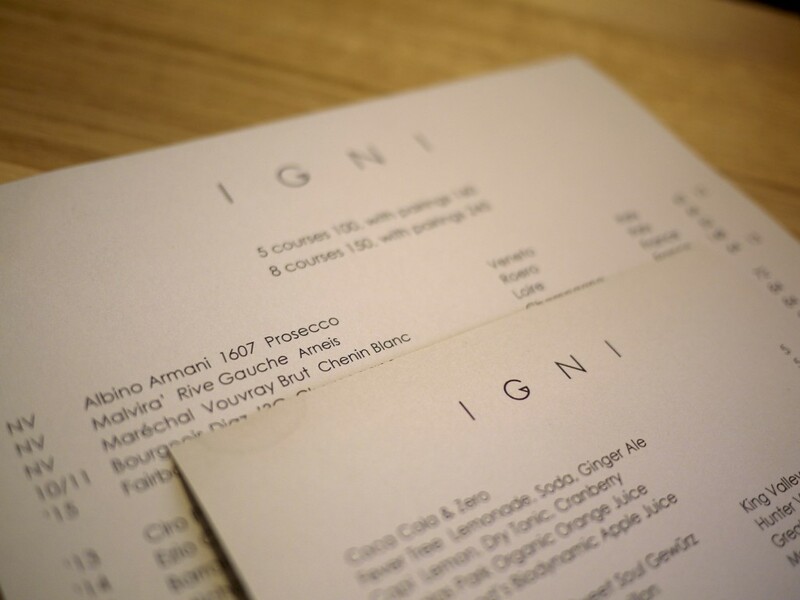 His new restaurant Igni promised to deliver far more refined food than Loam with a focus on using a charcoal grill like Lennox Hastie’s Firedoor. After a rather disappointing meal at Firedoor I was praying for something better. The generous amount of space in a modest sized dining room made the dining experience a rather intimate one. 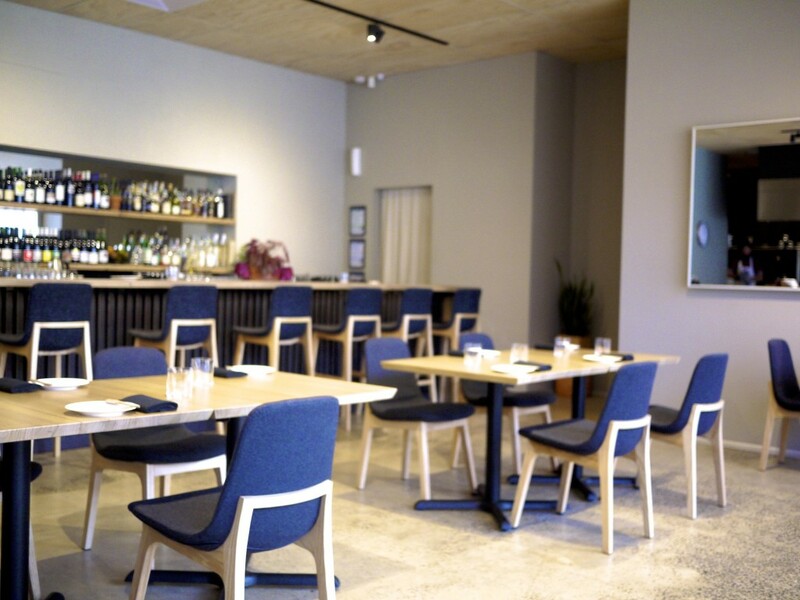 The raw timber and simple designs of the furniture were reminiscent of Noma and El Celler de Can Roca where Turner had previously trained and polished his skills. There’s also no escaping from the intoxicating charcoal grill smoke that adds that rustic canvas to a modern decor. 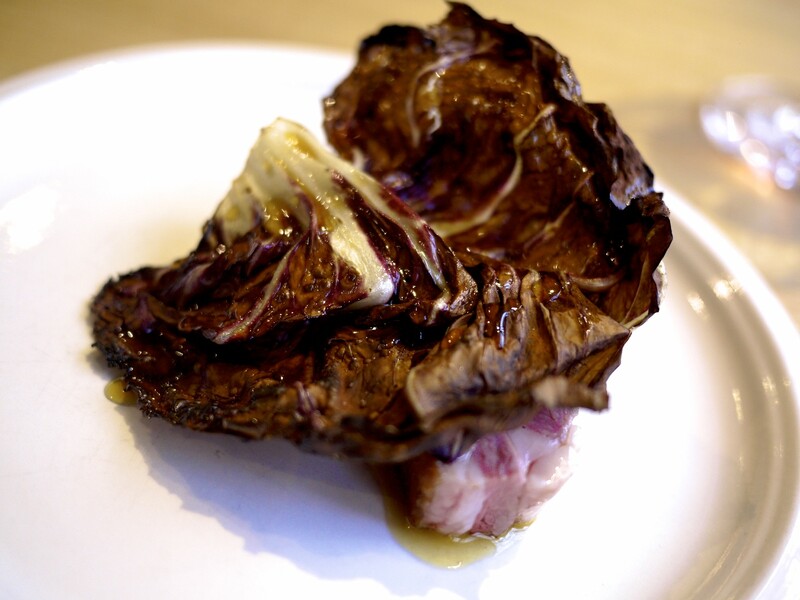 It took me back to my meal at Asador Etxebarri almost five years ago. Igni only had two degustation menus on on offer: a five course menu (AUD 100) or eight course menu (AUD 150). Turner only used fresh ingredients available on a given day so there was usually not enough of one ingredient to go around for all diners. To top it off, the chef also catered to each diners likes / allergies so each table was not likely to be getting the same dishes. We were perhaps not overly helpful when asked about likes and dislikes as all I could come up with was “No bad food, please”. As with most degustation menu options there were also matching wines available for both menus… Who am I to say no? 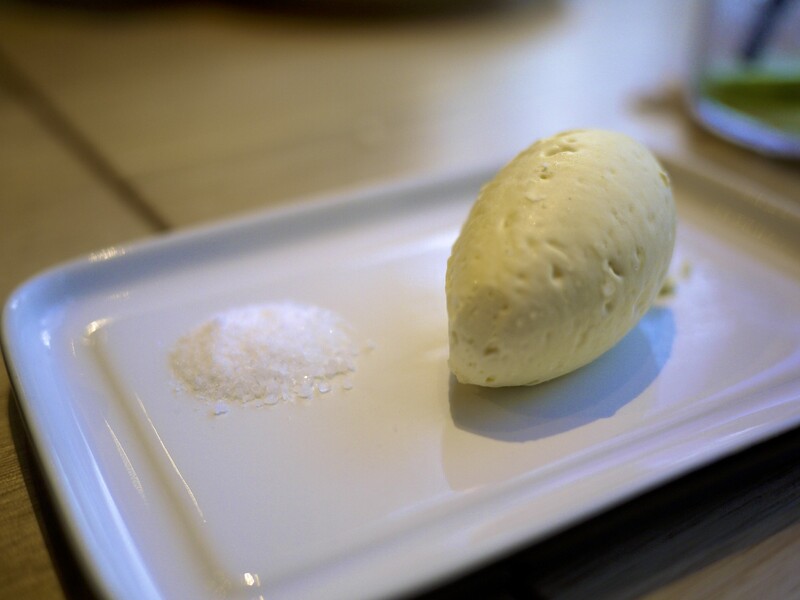 … the smoked home cultured butter that really got our palate going. We subsequently had another two serves. 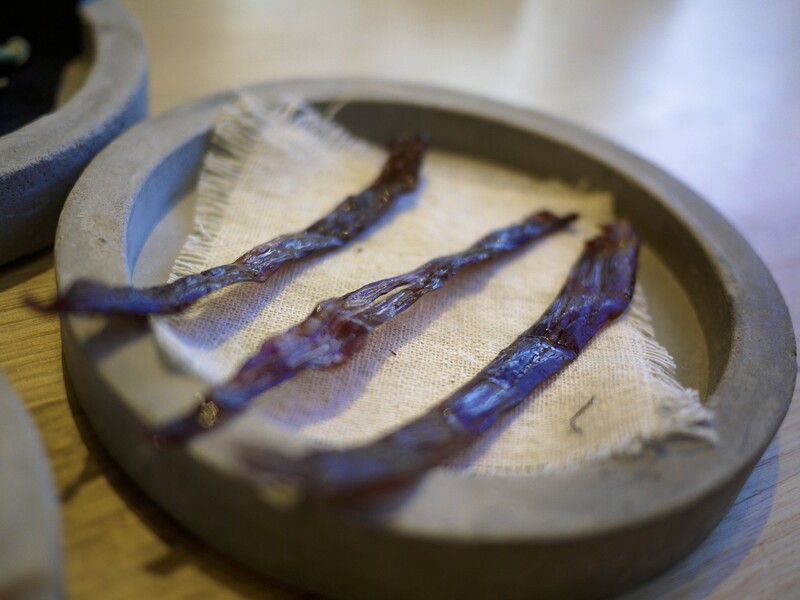 Amuse Bouche 1: Air dried beef – The beef had been marinated in a concoction of mushroom soy sauce, grapeseed oil, vinegar, dried herbs and fish paste before being dehydrated. Delicious! 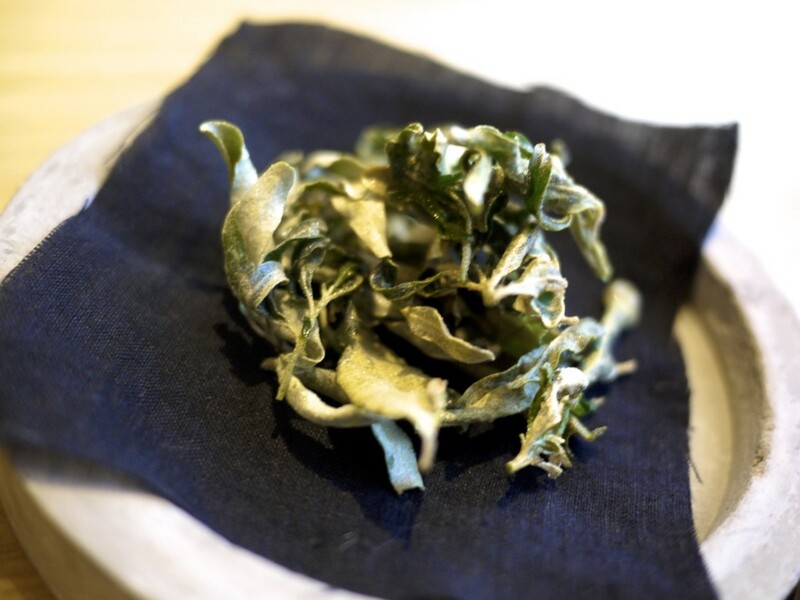 Amuse Bouche 2: Salt and vinegar saltbush leaves – The saltbush leaves had been fried to a crisp and dressed with a vinegar powder. It was a healthier alternative to salt and vinegar chips and rather delectable. Amuse Bouche 3: Duck Crostini – A lovely fatty slice of duck ham wrapped around the thinner-than-usual crostini which was as texturally pleasing as it was flavoursome. 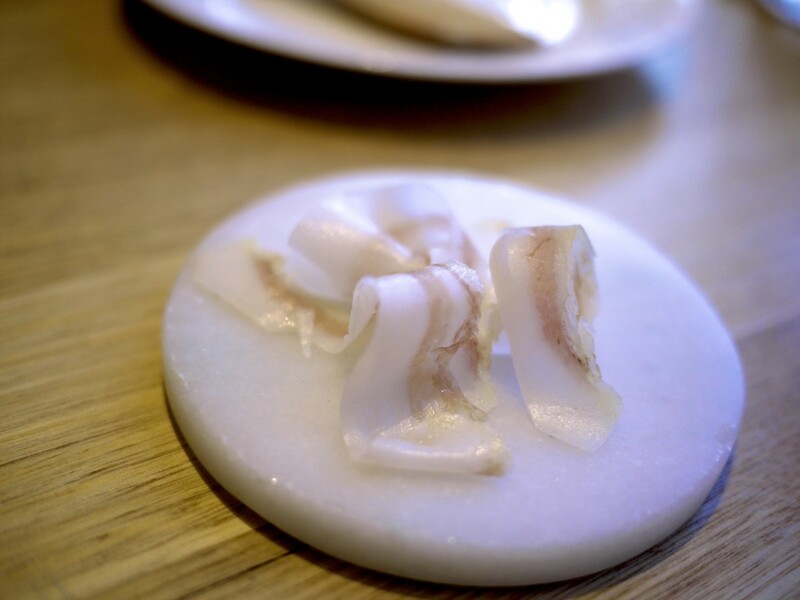 Amuse Bouche 4: Chicken skin and cod roe – My personal favourite of the amuse bouche series were the crunchy roasted chicken skin that had a generous portion of cod roe with a hint of citrus spread across it and dressed in dill. This was exactly my kind of food. 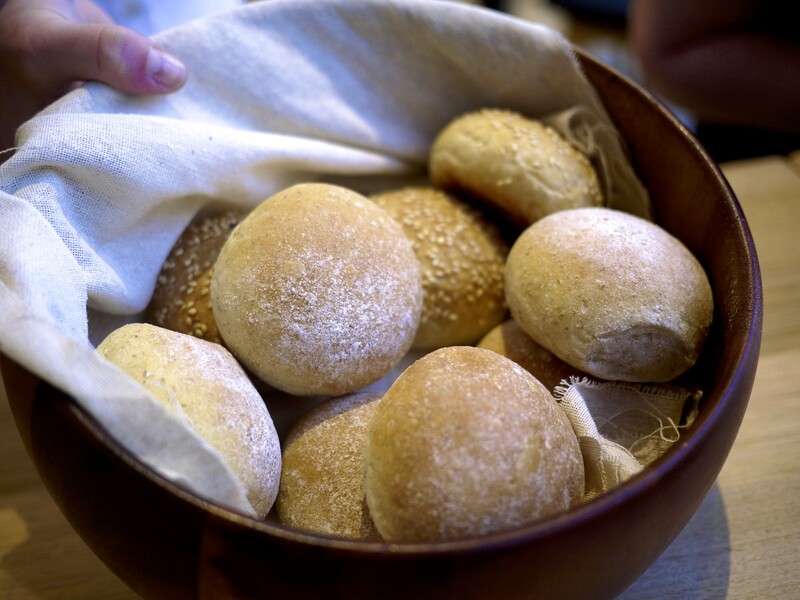 Comforting, different but most importantly delicious. 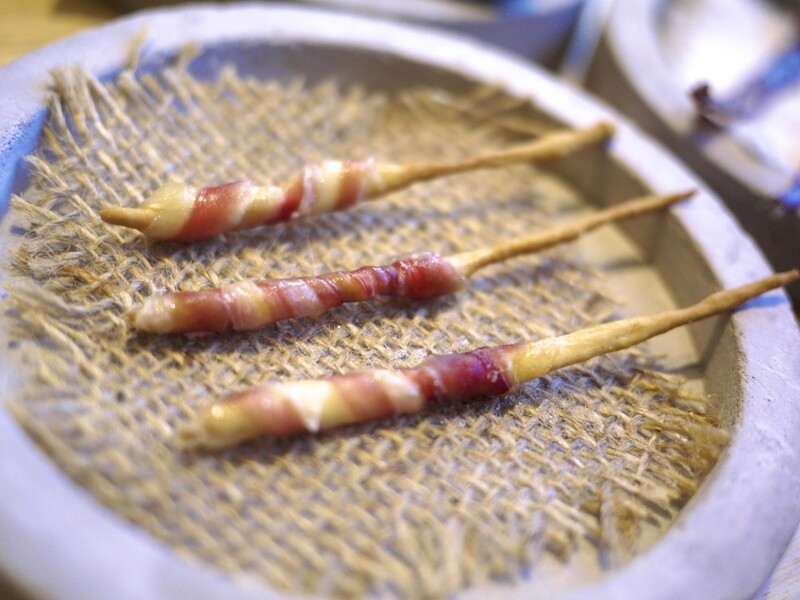 Amuse Bouche 5: Guanciale – House made slices of guanciale. 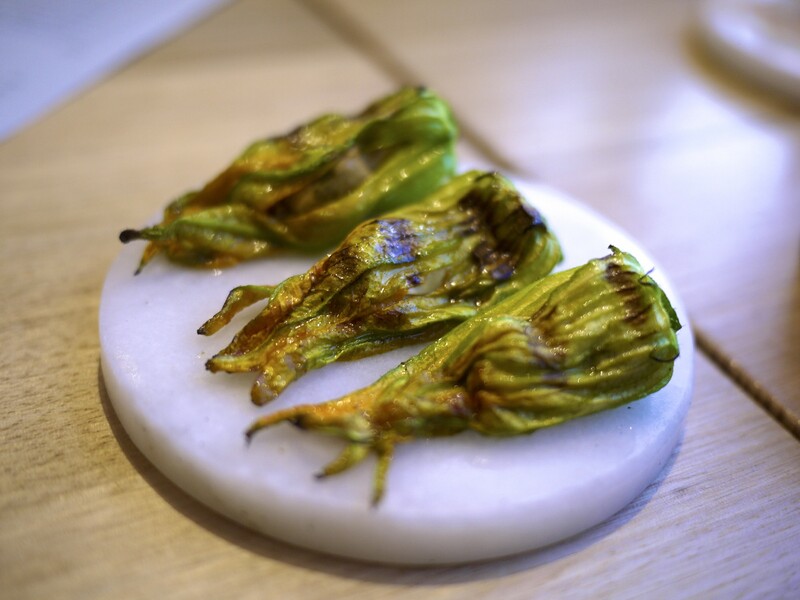 Amuse Bouche 6: Zucchini flower and pickled mussel – The zucchini flower had been stuffed with pickled mussels before being grilled over charcoal. This was the end of our amuse bouche segment. Not a bad start at all. 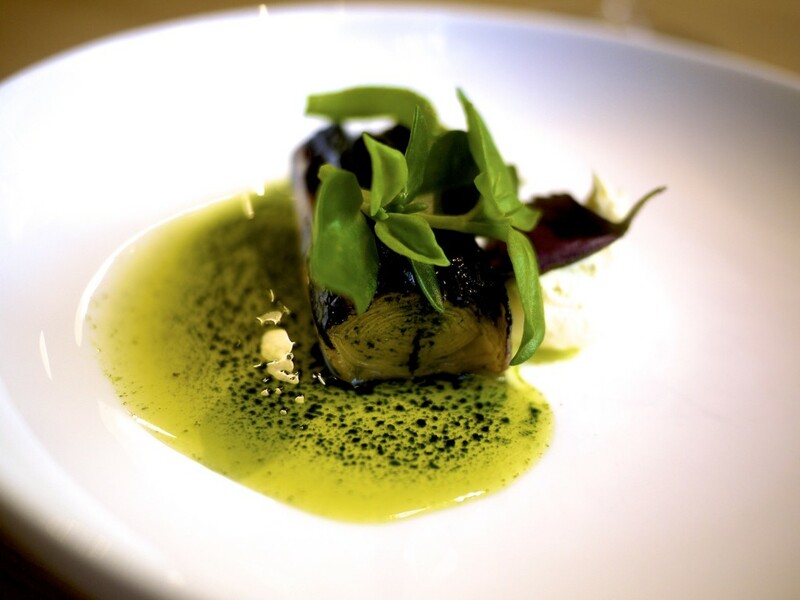 Overall, some interesting textures, flavours and ideas. 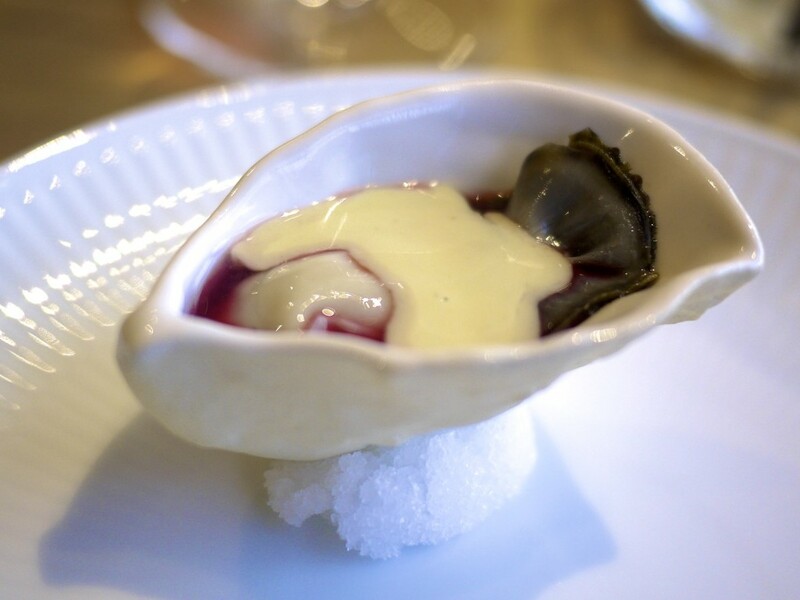 Course 1: Oyster, guava berry, sea water – Our first course consisted of a lightly roasted oyster that had been placed in a ceramic oyster shell with a salty sea water emulsion and guava berry juice. All the flavours worked well including the slightly tangy guavaberry which I had never tried before (apparently it goes well with rum!). The overall taste echoed the taste of the ocean. Light, fresh and mineral. 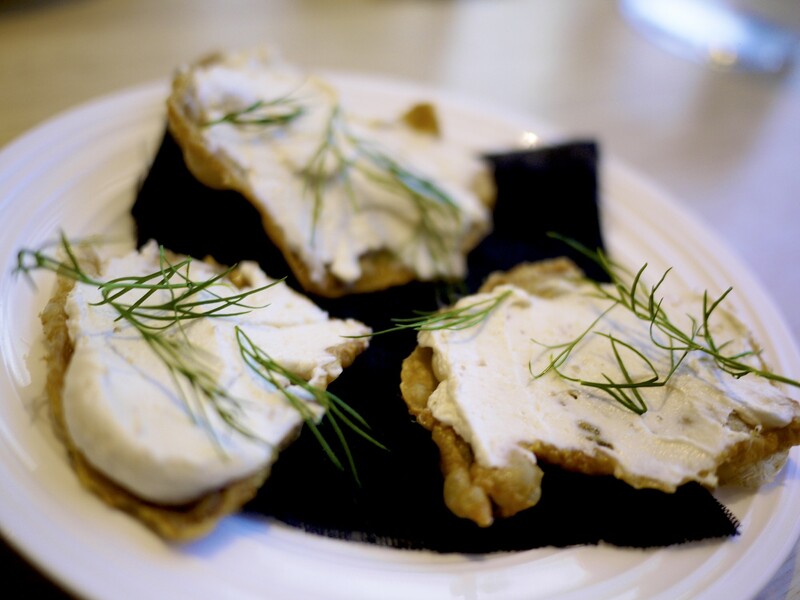 Course 2: Leek, cultured cream, dill – A fat piece of char grilled leek served with cultured cream, dill oil, saltbush and oyster leaf. I was not the biggest fan of this dish. I could see that Turner was trying to celebrate the humble leek in the same way the Catalan do with their Calçot, but I found it rather bland and at best slightly bitter. It looked better than it tasted. 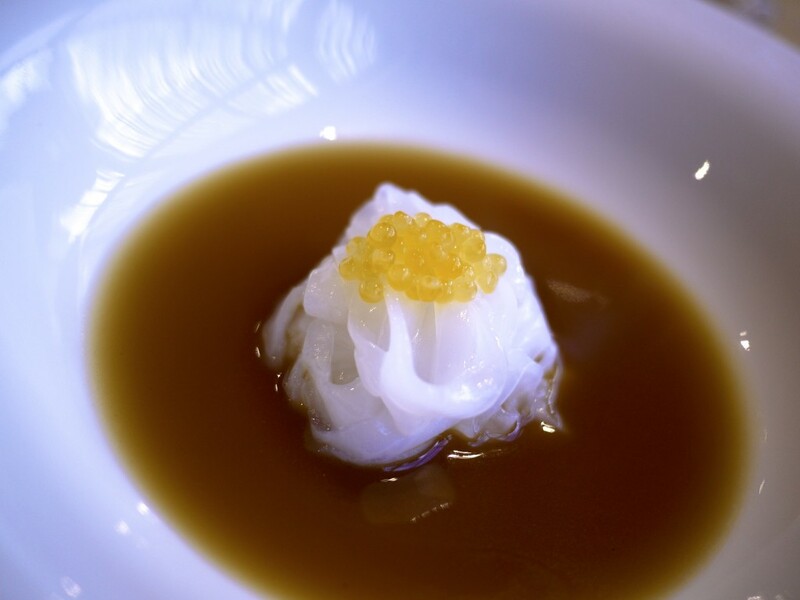 Course 3: Southern Calamari, broth, brook trout roe – This was a better dish. Raw thin calamari ribbons, dressed with a generous portion of trout roe and finished with a marron and chicken broth poured at the table. The broth had a good depth of flavour, perfect to be mopped up by the incredibly thin slithers of calamari. Its aroma was equally inviting. Course 4: Marron, pil pil, cucumber – Admittedly this dish divided us a bit. 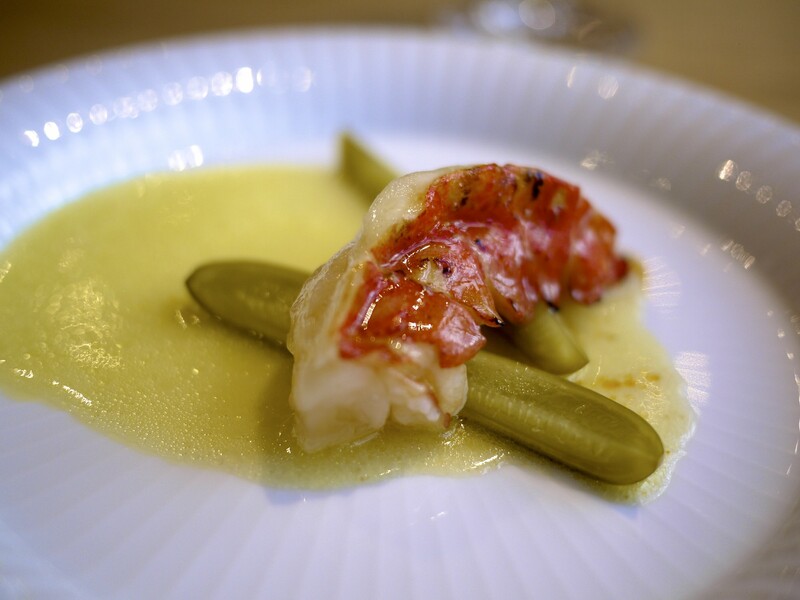 The lightly grilled marron was an odd combination with the fermented pickled cucumbers, yet the Basque pil pil sauce worked brilliantly well. Overall, however, there was one flavour that lingered in our mouth and that was the pickled cucumber. I thought it was a bit of a shame for the beautifully cooked marron. 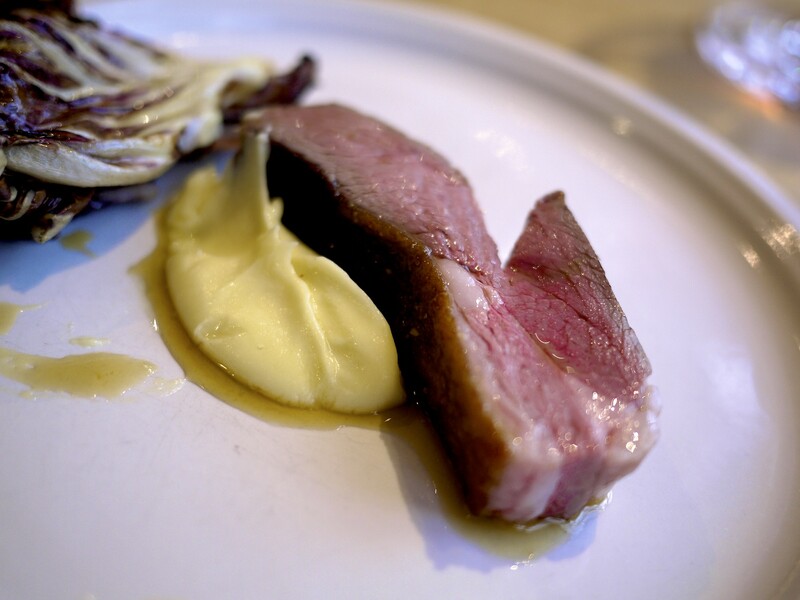 … a smooth parsnip purée and a piece of perfectly cooked lamb which was unbelievably tender and juicy. The honey vinaigrette worked well to balance the bitterness of the radicchio. Every element here was important in creating a very well balanced dish. I’m not easily impressed by red meat dishes but this was quite good. 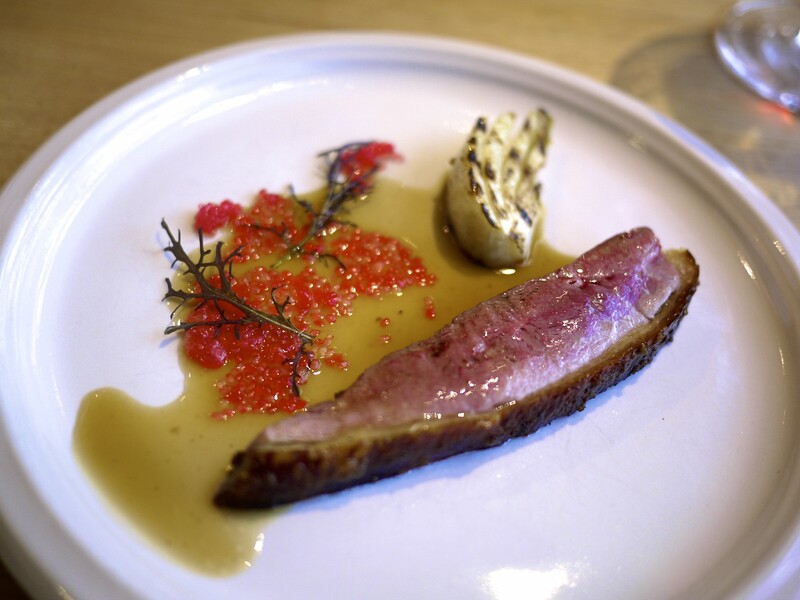 Matched with 2013 Brendan Tracey, Gorge Seche, Loire, France Course 6 (Extra course at supplementary cost): Smoked duck, baby fennel, finger lime – Perhaps it was the caliber of the last course but we felt we could do one more meat course before moving on to the dessert courses. This was the best decision we made. The free roaming ducks sourced locally from the Great Ocean Road were aged for 21 days before being smoked. 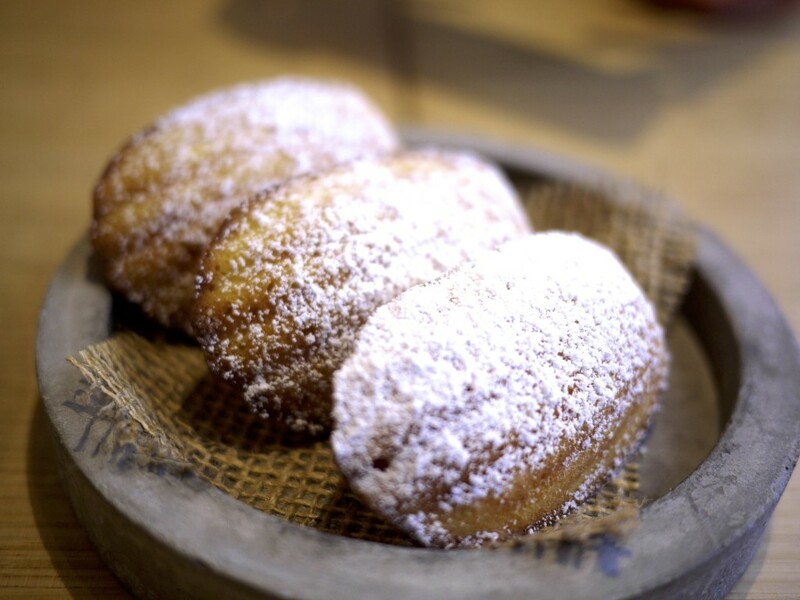 The crispy skin, the smokey meat, the bursting bubbles of finger lime. What a treat to the taste bud! 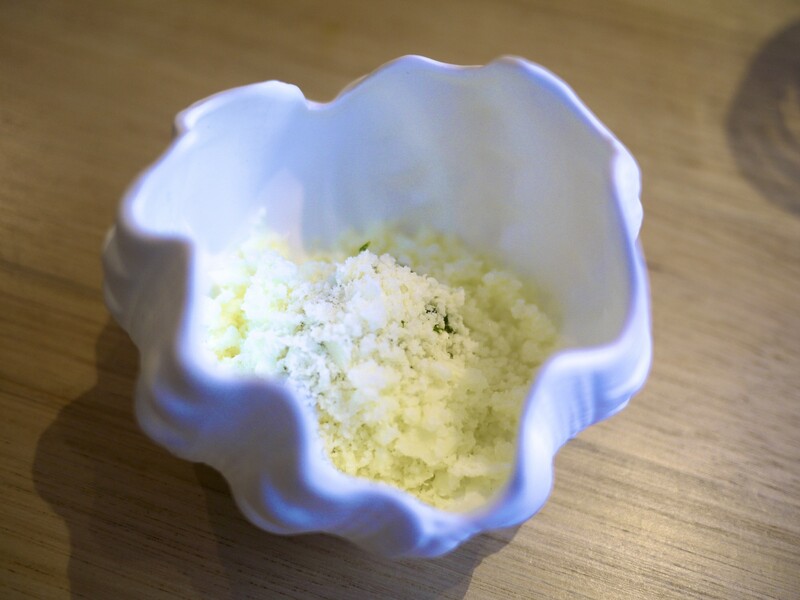 Course 7: Old ewe, new ewe – Essentially a mixture of Roquefort cheese, mint and sheep milk granita. An interesting take on Roquefort but I would have much preferred a plate of good old Roquefort to be honest. 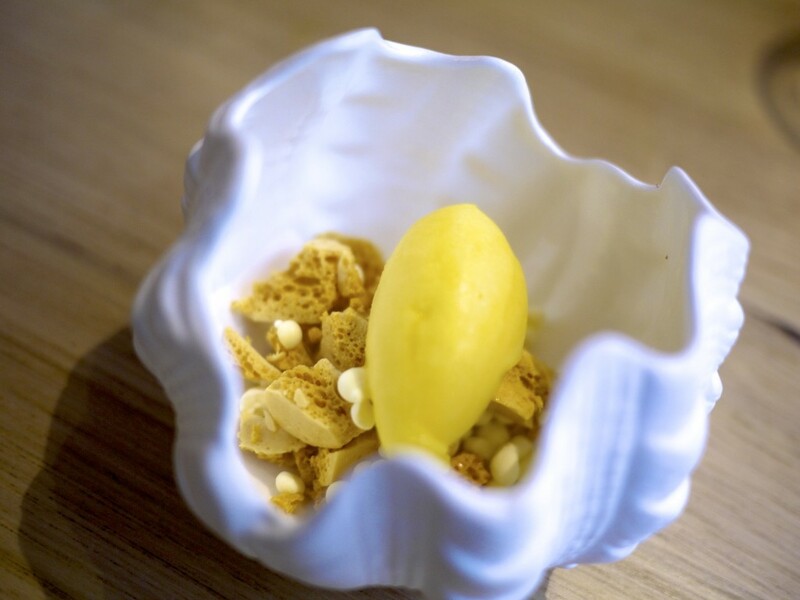 Course 8: Mandarin, cream, honeycomb – To my relief it wasn’t another cheese course but this time it was a bowl of mandarin sorbet, cultured cream, lemon drops and honeycomb using real honey for a change. Refreshing and great flavours from a tried and tested combination. A perfect course to make way for the finale. 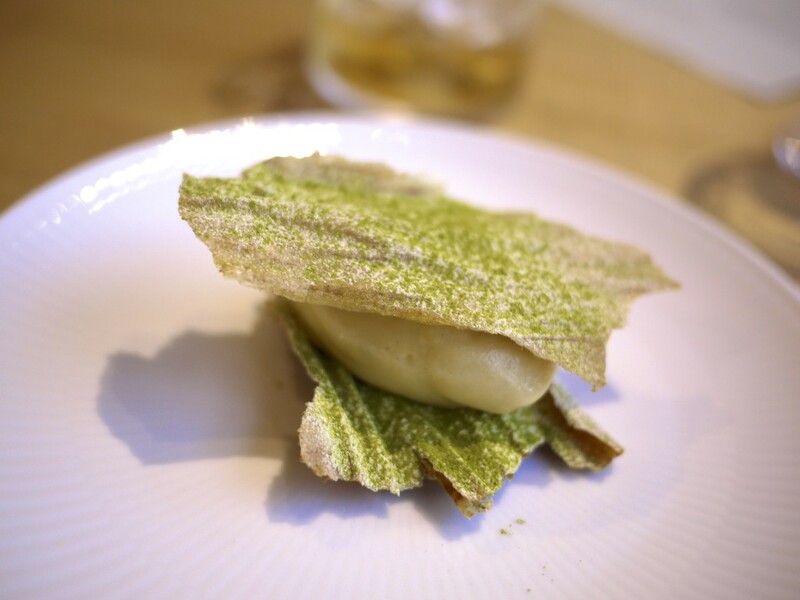 Course 9: Seaweed, quinoa – A rather polarising finale of a sweet and sticky goats milk ice cream flavoured with seaweed, sandwiched carefully between thin and crispy quinoa wafers dusted with a green tea powder. I personally thought the dessert was a triumph. The umami and saltiness of the seaweed, the sweet and sticky ice cream and the slightly bitter green tea. It all just complemented each other. Petit Fours 1: Madeleine’s coated in icing sugar to finish the dish off. 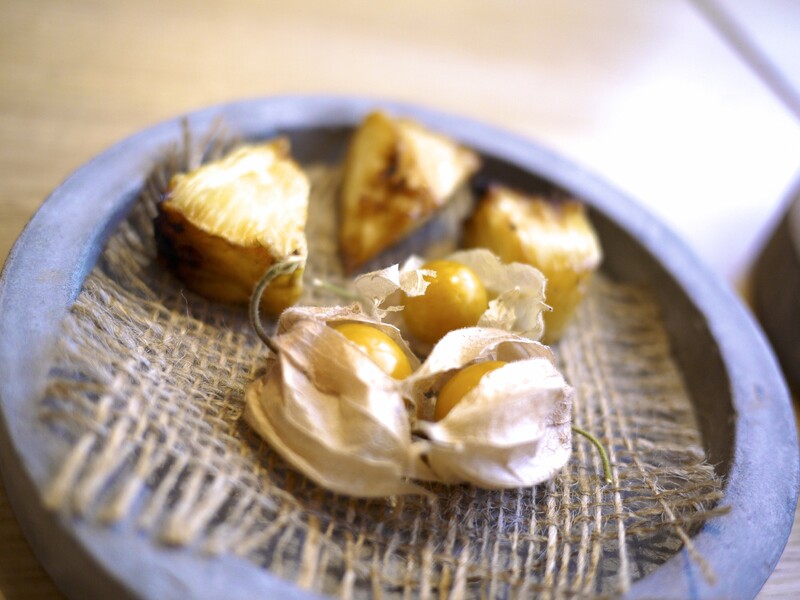 Petit Fours 2: Roasted pineapples and physalis to draw the meal to a close. 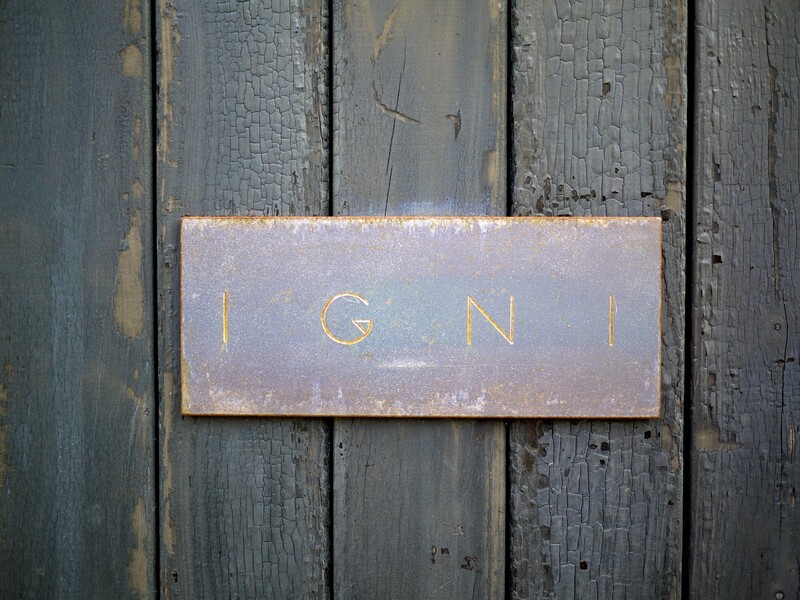 Perhaps it was the friendly front of house who put up with my wanker food talk with a grain of salt and good humour, or it may have been the intoxicating smell of burning charcoal, but there was something in the air that made you feel at ease in Igni. The food was very serious but equally comforting and delicious. What was a pleasant surprise was that the food here was far more enjoyable and less pretentious than Firedoor in Sydney. Whilst we decided to drive from Melbourne, the station is only a few minutes walk if one wanted to partake in the very reasonable and excellent wine matching option too. It was a few years of waiting but I’m glad I finally had the opportunity to try Turner’s food. His future looks promising. Let’s hope he keeps this one open for a while. I certainly will be planning to return there a couple more times. This entry was posted in Australia and tagged Aaron Turner, Asador Etxebarri, Australia, Charcoal, El Celler de Can Roca, Firedoor, Geelong, Igni, Lennox Hastie, Noma, Victoria on June 7, 2016 by admin.